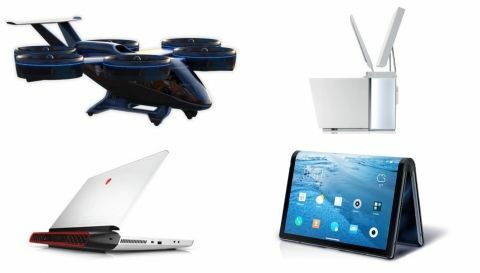 You know which laptops and smartphones were showcased and launched at this year's CES. But what about the other cool stuff? Here's a roundup of ten whacky devices you may have missed. You probably already know that Uber has plans of starting an air taxi service sometime in 2023. Bell, one of Uber’s travel partners showcased the prototype of its flying taxi, the Bell Nexus, at the CES. The Bell Nexus is capable of vertical takeoff and landing (VTOL) thanks to its four large propulsion rotors. Though Uber plans to start its air taxi service in the US first, the American taxi service company will bring it to Indian skies as well. Watch the video below to check out the interiors and the cockpit. While big players in the smartphone market like Samsung and LG are still working on their foldable smartphone, China-based smartphone manufacturer Royole Corporation is already selling its production-ready smartphone in China. Called the FlexPai, the large, folding phablet has a 7.8-inch 4:3 display. It can be folded in the middle to become a 4-inch smartphone. The resolution of the display is 1920 x 1440 pixels. Check out the foldable FlexPai’s demo below. How crazy can CES get? Even something so everyday as a coffee table is cool and feature-filled. Paying homage to the beloved 70s game, the Atari Pong Coffee Table enables classing Pong gameplay with the use of custom mechanical components. Both single-player and two-player modes exist. It also doubles up as a Bluetooth speaker and as a smartphone charger. It features four USB ports in total and has an LED clock display. Check out the table in action in the video below. Here’s a foolproof solution for your eternal fear of being pickpocketed. Smart wallets from the crowdfunded company Volterman come decked to the gills with smart features like a worldwide GPS tracker, an inbuilt power bank to charge smartphones wirelessly, and a thief-detector camera inside. Additionally, it can sound an alarm if you leave your smartphone behind. Volterman offers three kinds of smart wallets: Bifold, Cardholder, and Travel Wallet. Get a better look at the Volterman smart wallet in the video below. Planning a marriage proposal but don’t know what to get? This ring here sets itself apart by a huge margin. The ORII voice-powered ring sits on your finger like any other ring but is capable of sending and receiving audio messages through a connected smartphone. Because audio is passed on using bone-conduction, the user simply has to place their fingertip against their ear to send and receive messages. With a battery life of 48 hours in standby mode, the ORII Voice Powered Ring is a pretty nifty device. Watch the video below to see it in action. Just how smart can toilets get, you ask? Well, the American plumbing products company just threw Amazon Alexa into one of its toilets and connected it to its proprietary smartphone app, Kohler Konnect. Called Numi, the toilet can automatically open the lid and warm the seat on sensing your approach. It also features nightlight and ambient lighting, automatic deodorisation, and a foot warmer. It can also be controlled with the help of a touchscreen remote. Take a look at the collection Kohler had to show at this year’s CES in the video below. Alienware presented Legend, a redesigned identity for its brand and products at this year’s CES. First to reflect Legend, the Alienware Area 51m is a gaming laptop with upgradeable CPU, RAM, and graphics card. The Area 51m is one of the first laptops to come with Intel’s 9th Gen Core series of CPUs. It also comes with intensive gaming features like Tobii eye-tracking. Check out the cool new Alienware Area 51m in the video below. We’ve seen the Nubia Red Magic gaming smartphone before (here’s the review too), but what we saw at CES is the Mars edition of it. Though there’s no upgrade to the powertrain inside, the rear panel sees a nice refresh. The four red strips you see along the corners mark the liquid cooling tech inside. As was the case before, the Nubia Red Magic Mars is powered by a Qualcomm Snapdragon 845 CPU, and has 8GB and 10GB RAM options. Get a closer look at the Mars edition of the gaming smartphone in the video below. The Nissan IMx KURO is no ordinary car concept; make no mistake about that. Apart from looking futuristic, it can interpret thoughts in your head as input for steering and acceleration. What’s more, it’s completely electric. Its two motors produce a total of 435 horsepower. According to Nissan, its batteries provide a range of up to 600 kilometres on a single charge. Get a better look at the Nissan IMx KURO crossover concept in the video below. If developers had to wear a uniform, this would be the coolest uniform yet. The Teslasuit is a full-body suit that can transmit haptic sensations from digital VR or AR environments using electrical stimulation. It supports full-body motion tracking with plugins for 3D animation tools like Autodesk MotionBuilder. Its climate control system lets the wearer experience ambient heat and cold naturally. Take a closer look at the Teslasuit in the video below. Are your smartphone sensors making you vulnerable?